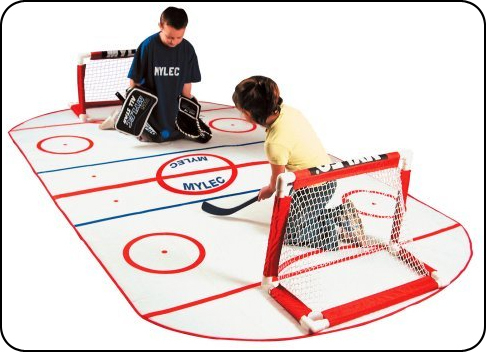 Add realistic hockey action to your hockey games with the mini knee hockey mat. Provides hours of fun for all ages. Check out our Mini Goal Nets and Stick Sets too for a complete rink! Measures 5' x 10' overall size. Tough, lightweight padded mat. Rolls up and ties with sewn on Velcro strap for easy storage and travel. Lines, creases and face-off circles bring realistic rink action to your knee hockey game. Contains one rink mat. Goals, sticks, etc. sold separately. Constructed very well - built for Family Fun - built to last! Has all the marking of a regular Hockey Rink. Durable and rolls up easily for travel. We have everything else you need to complete your rink. Safe for all family members to use and play on – family fun! Measures: (5’ feet wide x 10’ feet long) Features a neat Velcro Strap for storage and travel. Check out all of our other Accessories to complete your ice rink!